More than 100 dogs and cats arrived in San Diego County Monday from a shelter in Louisiana, where the operators are clearing out space to house animals rescued from Texas and Louisiana in the aftermath of Hurricane Harvey..
“When disasters strike and the country needs help caring for lost, strayed or abandoned pets, they turn to San Diego,” said John Van Zante with the Rancho Coastal Humane Society. He said the Wings of Rescue flight carried 85 dogs and 20 cats from Louisiana. “These pets are being transferred from Lafayette to create room for the Texas and Louisiana pet victims of Hurricane Harvey,” Van Zante said. The dogs and cats will be taken to several facilities across San Diego, including Labradors and Friends Rescue, San Diego Humane Society and Rancho Coastal Humane Society. They’ll also be available for adoption, perhaps sometime later this week. “We’ve been told that the hurricane pet victims will begin arriving in Lafayette almost immediately after these pets leave,” Van Zante said. Harvey, which is now a tropical storm, made landfall in Texas on Friday night as a Category 4 hurricane before moving back over the Gulf of Mexico. It has already dropped more than 30 inches of rain in some areas and caused devastating flooding in Houston and the surrounding areas. Animals lost and abandoned in the flooding will be taken to the Acadiana Animal Aid shelter in Lafayette, while the cats and dogs that were at the Louisiana shelter will now be available for adoption in San Diego. 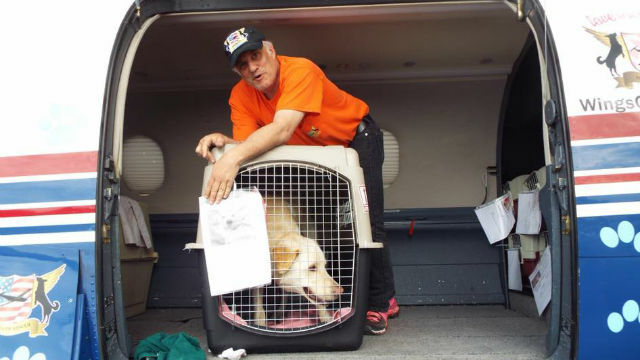 The transfer of the pets was part of a joint effort by Wings of Rescue, GreaterGood.org, Labradors and Friends Rescue, the San Diego Humane Society and Rancho Coastal Humane Society. All five organizations are accepting donations to help cover the costs of the flight and to provide care for the animals once they arrive. “No pet should die because it was born in the wrong state,” Van Zante said.